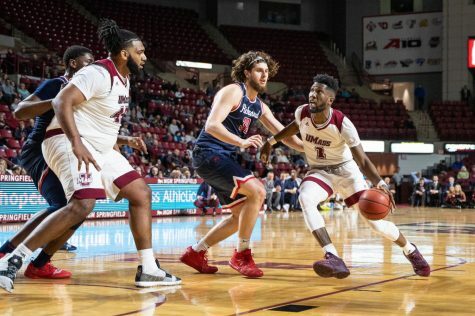 While guard Anthony Gurley scored the final two points to give the Massachusetts men’s basketball team a victory on Wednesday night, he did so without making the final basket. 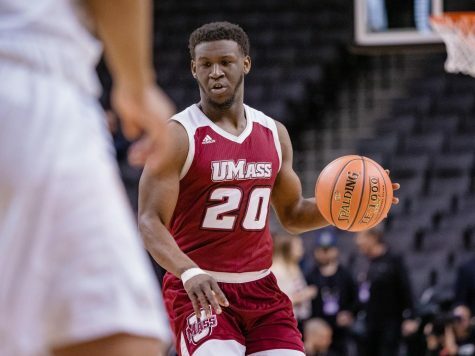 With one second remaining, the Minutemen (7-0) inbounded the ball to Gurley whose lay-up attempt was blocked and ruled goaltending to give UMass the 66-64 victory. The victory did not come easily for the Minutemen, as they blew a 17-point halftime lead which made the game a tightly-contested battle all the way down to the wire. 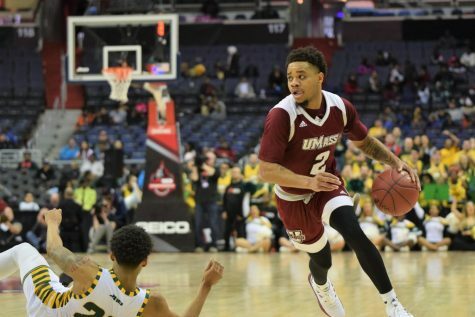 Despite the tough battle, UMass players still displayed strong athletic performances. Gurley finished the game with 19 points, including the game-winning basket. Leading the charge on the offensive end was Javorn Farrell, who earned 25 in the game along with five rebounds and an assist. Freddie Riley dished the ball out three times to earn the team-high. 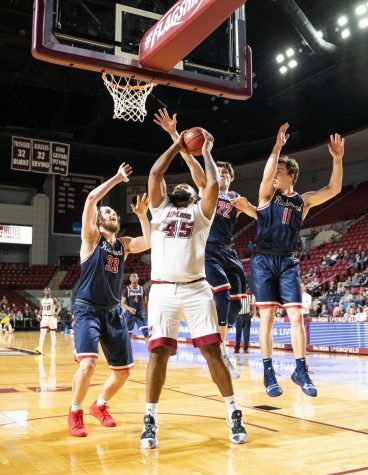 He also had three rebounds and seven points to add to the offensive push the Minutemen gave out, but was not his usual self behind the arc, going 1-for-7. The first half was strong for the Minutemen, as they led 40-23 through the first 20 minutes, forcing the Bobcats to commit 10 turnovers in the half. UMass stayed true to its form from the past few games, opening up the game early and pulling ahead. While the Minutemen were close with the Bobcats with a 9-7 lead, UMass pulled away off points from the trio of Riley, Gurley and Farrell. The early piece of the first half showed a strong UMass defensive performance, with the Minutemen forcing the Bobcats to six turnovers through the first 11 minutes. Additionally, UMass pushed on the offensive front, going on a 10-point run which showed Gurley leading the team with six points at that time. Gurley finished the half with 10 points, just behind Farrell, who had 14 in the first half. Farrell put on a show in the first half against the Bobcats. Not only did he lead the team in points off an assortment of moves, but he also dished out one assist and took down three rebounds en route to UMass’ 17-point lead at the end of the first. 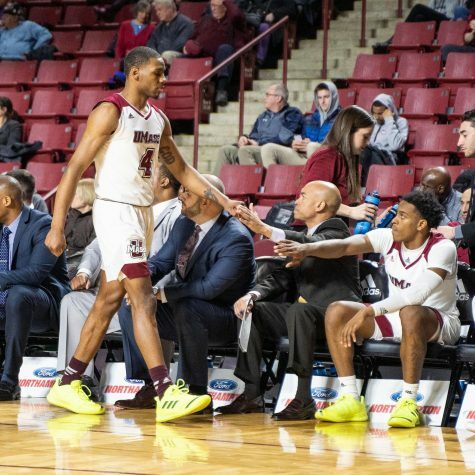 The Minutemen once again faltered in the second half on the road, failing to break the negative trend that they’d picked up in recent games at the Mullins Center. The 17-point lead dropped down to nine points in the second half, with the Bobcats opening up the second period with 17-9 run to climb back into the game. Justin Rutty was big for QU, scoring 12 points with the same amount of rebounds by the end of the first 10 minutes of the second half. The lead continued to dwindle from there. 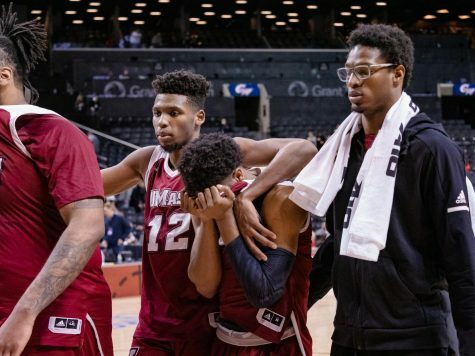 Going along with their late swoons from earlier games this season, the UMass lead dropped to just four points with six minutes, 50 seconds left in the second half. “They did a good job of building a wall in the paint,” Kellogg said. However, behind Sampson Carter and Riley, the Minutemen rallied forth with five straight points to push the score to 56-49. Yet even as the UMass side tried to stop QU, the Bobcats tore through the Minutemen defense to tie up the game at 59 apiece with two minutes left to play. Under a minute to go, UMass held possession at the top of the court. Gary Correia gave the ball off to Farrell, who found Gurley waiting in space. Gurley dribbled with the ball for a brief moment and, with five seconds left on the shot clock, stepped back and nailed a 3-pointer to give the Minutemen the 64-61 lead. In back-and-forth fashion, the Bobcats came right back and Deontay Twyman nailed a 3-pointer to knot the game back up. In a rush the Minutemen traveled down the court, Farrell handling the ball. Farrell shot a floater, which went in-and-out, and then bounced out of bounds off of QU. With one second remaining on the clock, UMass sent the ball in to Gurley, who couldn’t finished the play, but finished the game with the critical goaltending call that ended the game.